Ticket to the classic musical 'Tell Me On A Sunday' at the Bord Gais Energy Theatre on Sunday May 1st. 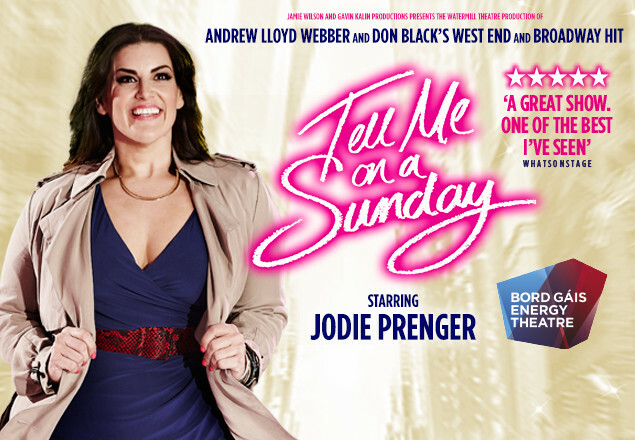 With this exclusive Rewarding Times deal we are offering a ticket to Andrew Lloyd Webber and Don Black’s classic musical TELL ME ON A SUNDAY starring JODIE PRENGER for just €20. It charts the romantic misadventures of a young English girl in New York in the heady days of the 1980’s. Brimming with optimism, she seeks success and love. But as she weaves her way through the maze of the city and her own anxieties, frustrations and heartaches she begins to wonder whether she's been looking for love in all the wrong places. This iconic one-woman musical, with a wonderful original score, features the chart-topping Take That Look Off Your Face and the title track Tell Me on A Sunday. JODIE PRENGER is best known for winning the role of ‘Nancy’ in Cameron Mackintosh’s West End production of “Oliver!” through the BBC television series “I’d Do Anything”. Jodie wowed audiences playing the title role in the UK and Ireland tour of the musical “Calamity Jane” and she has also starred “Spamalot” and the National Theatre’s “One Man, Two Guvnors”. This new production of TELL ME ON A SUNDAY includes an intimate chat with Jodie about life, love and playing the role of Emma. Vouchers are valid for the show on Sunday 1st May. You must bring your printed voucher as proof of purchase. It can be redeemed at the Box Office from Monday 25th April. The offer can be redeemed at the theatre box office from Monday 25th April until Sunday 1st May. Box office hours are 11am-6pm Monday to Friday and an hour before the show.